We set up the table with the wine and discussed tasting order. Sheila recommended we start with the Riesling (as she thought the others would overpower it), followed by the Chardonnay, and then the Vidal Blanc. Full disclosure: I received these wines as a press sample. The wine is a golden yellow in color with lovely aromas of honey and apples (maybe a touch of apricots). It had a rich, creamy feel in the mouth, and it tasted like it smelled — lots of very sweet honey and apple with enough acidity to balance that sweetness. This wine is a dessert by itself. We all enjoyed this one, and Joe was particularly enamored of it. I would much like to see what this wine will be like in a few years. The Weinrieder Estate is near the town of Poysdorf, just 50 km North of Vienna, in the Weinviertel region. Wine growing in the Weinviertel region dates back to at least the 12th century, and the area is known for its sparkling wines. 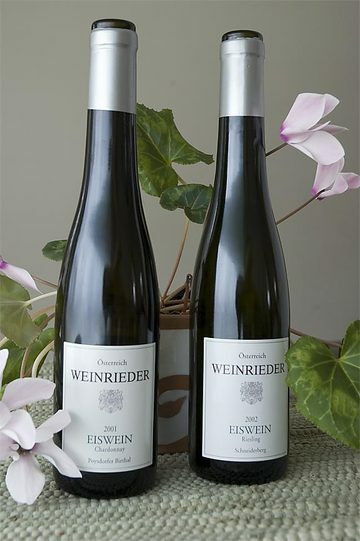 Weinreider Estates is specifically known for its high quality white wines, including Grüne Veltliners, Rieslings, Chardonnays, and Weissburgunders, as well as its dessert wines: Eiswein, Trockenbeerenausleesen, and Strohwein. Weinrieder is imported into the US by the Blue Danube Wine Company in Los Altos, California, so they're the people to contact if you want to locate a bottle. WB #27: a gaffe! No, two! I missed two (ow!) entries for WBW #27 Ice Wines. (Mea culpa!) I've updated the Round Up, but if you've already read through it do also check out the entries from An Obsession with Food and Doktor Weingolb. WBW #27 ROUNDUP: Ice Ice Baby! It's been a pleasure to host this edition of Wine Blogging Wednesdays, founded by Lenndevours. A big thank you to all WBW #27: Icy Desserts participants who ponied up for a bottle of ice wine and shared your thoughts and stories. You all blogged from Australia, Canada, Germany, Spain, the United Kingdom, and the USA. I learned a lot for this. For starters, I never knew there were so many wine blogs out there in the wide world of the Internet sharing their knowledge and experiences with wine. Oenology is an intimidating field to "wine newbies", you all help make it more approachable and fun. With that we kick off this round up with "snekse" from Gastronomic Fight Club, who is no stranger to ice wine, but rather than pull out a familiar bottle decided to shop for something new and discovered the 2003 Covey Run Semillon Reserve Ice Wine from Washington, USA. Down in the Southern Hemisphere, Haalo from Cook (almost) Anything at least once in Melbourne trekked out to the cellar door of Long Gully winery to bring back a bottle of Long Gully 2004 Reserve Ice Riesling, Yarra Valley, Australia. We all know how expensive ice wines can be, and finding a good one that doesn't break the bank can be a challenge. Dr Debs at Good Wine Under $20 in Los Angeles, CA, tracked down a budget-friendly ice wine that is readily available and presents to us the 2004 Jackson-Triggs Vidal Icewine Proprietors' Reserve from Ontario, Canada. Just "a bit" up the coast in San Francisco, Sam of Becks and Posh couldn't resist combining a chocolate tasting with wine tasting, and discovered that a sichuan-flavored chocolate pairs well with 2004 Inniskillin Cabernet Franc Icewine, Ontario, Canada. Across the continent in New Jersey, Serge of Serge the Concierge takes a unique twist on the theme and introduces us to an ice wine vinegar called Minus 8 Wine Vinegar from Canada. The grapes are picked frozen, just like an ice wine, but processed into vinegar instead of wine and allowed to age. And back to Melbourne, Australia, where Ed at Tomato experiences divine intervention when pairing 2002 Inniskillin sparkling Vidal ice wine from Ontario Canada with a mango tarte tatin. In San Francisco, Alder of Vinography introduces us to our first European ice wine of WBW #27, 2001 Weinrieder "Poysdorfer Schneiderberg" Riesling Eiswein, which is from Weinviertel, Austria, a region that has been producing wine since 1194. Up in the Great White North of Winnipeg (hey, from where I live Winnipeg is part of the Great White North), Manitoba, Canada, Alec of Wine in the 'Peg gets in touch with his Canadian heritage with a bottle of 2004 Inniskillin Vidal Icewine from Ontario Canada. Columbus Foodie's Becke happily discovers 2003 Frozin from Meeker Vineyards in Sonoma County, California, an icebox wine made — unusually — from zinfandel grapes. At The Sour Dough, the "Breadchick" out in Massachusetts travels (metaphorically speaking) back to her childhood home of Northern Michigan to sample two Michigan-made ice wines Chateau Grand Traverse 2001 Johannisberg Riesling Ice Wine and the Black Star Farms 2002 A Capella Riesling Ice Wine. If you've wondered what it's like to bundle up in the middle of the night and harvest grapes under a cold winter night sky, hop across the pond to Heidelberg, Germany, where Thomas of Winzerblog gives us a first hand account of what it is like to pick and press grapes for ice wine. In what is WBW #27 most unexpected origins for an icebox wine, Ryan and Gabriella of Catavino discover in the 2003 Gramona Penedès Vi de Gel a wine to fall in love with from a Spainish winery. Garry of Tales of a Sommalier over in the U.K. presents two wines with German ties: CanadaPelee Island Cab Franc Icewine 2001, made by a German winemaker in Ontario Canada, and Bassermann-Jordan Forster Ungeheuer Riesling Icewine 1996 from Germany. Over in the "Land of 10,000 Lakes" (Minnesota for the rest of us), Tim of Winecast uses the power of the Internet to hunt down an affordable ice wine worth giving a try and fnds 2004 Burgherrn Weinhandels, “Nachtgold”, Eiswein from Germany. Up in the Finger Lake region of New York, an area I would very much like to visit, Jennifer of Cookin' in the 'Cruse samples this "fruit bomb" of an icewine, 2003 Select Late Harvest Riesling Ice Wine made by Hermann J. Wiemer Vineyards, Finger Lakes Region, New York. Jack and Joanne of Fork & Bottle in sunny California shares with us 2001 Zeltinger Himmelreich "JUNIOR" Riesling Eiswein from Selbach-Oster Winery, one of their favorite wineries in all of Germany. Bouncing back to the Down Under, Wino Sapien's Edward and friends give a bottle of 2002 Inniskillin Cabernet Franc Ice Wine a try. As someone who lives driving distance from Inniskillin, I found it interesting to read how much exporting wine to the other side of the world increases the cost, and now I want to see what Australian wines cost here in Michigan. Catherine of Purple Liquid watched the November 8 election results in California while sipping 2004 Jackson-Triggs Proprietor's Reserve Vidal Icewine from Ontario, Canada. Also in California, Derrick of An Obsession with Food takes us to one of Europe's newest nations in a region with a very old history in winemaking to taste the 2001 Laski Rizling Ice Wine from Zlati Gric in Slovenia! Lenn of Lenndevours reviews the "ice-style" Wolffer Estate's 2005 Late Harvest Chardonna, which won "Best Dessert Wine" at the 2006 New York Wine and Food Classic. Finally, you can read my own entry, which included sampling Lemon Creek Cabernet Sauvignon 2004 from the Lake Michigan Shore Region from my own home state. "Culinary Fool" continues the celebratory fashion with her theme for Wine Blogging Wednesday #28: Sparklers Find a non-champagne sparkling wine, check out the "rules" for the event, and post your findings on December 13th. For Wine Blogging Wednesday #27, I pulled together some friends who were kind enough to share the heavy burden (oh, twist our arms!) of tasting ice wines. Between us and them we had a total of four (!) wines and a table loaded with cheese, fruits, and a fruit tart. Knowing how expensive ice wine can be, I feel rather greedy with all of it, rather like a child who has hit the mother-lode of holiday presents. I will touch on all of them briefly as it was interesting to taste and compare their differences. Selaks Marlborough 2004 — Marlborough, New Zealand. New Zealand. A mix of Gewurztraminer and Riesling grapes. Honey colored. This was our "supermarket" (affordable) ice wine. It technically isn't a true ice wine -- either the grapes or the grape juice were frozen after harvest. We thought this wine was best when just opened, crisp with some citrus notes and a sparkling edge (some carbonation? ), but as it opened up it became "flabby". It didn't show well against the other ice wines, though maybe by itself it would have held up better. Ontario, Canada. 100% Vidal grapes aged in oak. Yellow color. There were definite sighs of appreciation around the table with the first sips. It started all desserty-sweet with tropical fruits and finished with what one of our tasters described as an undertone of oak — a definite change in character. Very balanced with a long finish. As it opened up, we thought the grapes and the oak became more pronounced. A lovely ice wine. Perhaps the most unusual description was: "Soda-popish but in a positive way." This was the most complex and sophisticated ice wine of the bunch. I suspect this one has also been tasted by other WBW #27 participants, and I look forward to reading what they have to say about it. Michigan, USA. 100% Cabernet Sauvignon. Joe and I picked this up in the Spring during a short vacation on Michigan's west coast. We visited several wineries in the Southwest Michigan wine region, and Lemon Creek was the one that I insisted we stop at because they make ice wine, and not just any ice wine but the only Cabernet Sauvignon ice wine in the States. So there. Michigan bragging rights. This red ice wine was not as complex as the Pillitteri, and I was a bit disappointed with it at first. It had a honey taste right off and a nose that mixed strawberries with fish (fish? what's up with that?) When this one opened up, the strawberries really came forward. So strong a flavor was it, in fact, that it felt like I was drinking strawberry nectar. Kinda of odd as a wine experience, but really quite yummy once it opened up. I have a second bottle of this, and I look forward to seeing if the strawberry qualities assert themselves as strongly when tasted alone. I'm so excited to be hosting Wine Blogging Wednesday #27, but before we move on to November's theme I want to remind people that Beau Jarvis at Basic Juice will be posting the results to his WBW #26 Contest very soon now. It's not too late to head on over and take a guess at at the mystery wines. You have until Saturday, October 21. It's a good time to be hosting Wine Blogging Wednesday #27, just in time to find something special to share with family and friends for the winter holidays. For those who are new, Lenn at Lenndevours proposed a monthly wine blogging event back in July 2004 and it's been running ever since. I put in my request to Lenn back in April 2005, and I must admit there were a few moments — with job changes, classes, and other twists and turns in life — when I wondered if I would still be blogging when my time came around, but I've survived! I think this calls for a celebration. I have a very, big soft spot for icewines, and I invite you all to join me in tasting this "sweet seduction in a bottle." 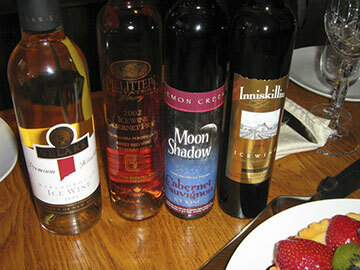 We first came across icewines when visiting Niagara-on-the-Lake in Ontario, Canada. I was amazed and delighted to discover this unique style of wine thriving so close to home. Icewine (Eiswein in German, but it means the same thing and is basically pronounced the same) is a late-harvest wine made by picking frozen grapes and pressing them before they thaw. To prevent premature thawing, the vineyards must pick the grapes at night or at latest in the earliest dawn hours (before the sun can have a chance at warming them), and all the grapes must be pressed within a few hours of being picked. With so much water locked up in the ice, the resulting juice makes for a concentrated rich wine that is very high in sugar but also balanced with high acidity. It's most commonly made from Vidal and Riesling grapes and a few other white grapes, but you can also find red icewines made from Cabernet Franc grapes. The main icewine/eiswein producing areas are Canada, Germany, Austria (and neighboring countries), with wineries in other cold-weather areas like the Northern U.S. and New Zealand experimenting with icewines, too. 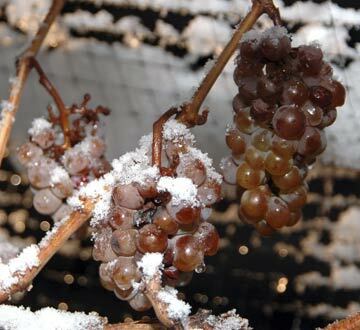 Genuine icewines must be made from grapes that froze on the vine and were pressed before they could thaw. There is another dessert wine made by artificially freezing already picked grapes and pressing them. In Canada or Germany, artifically frozen grapes aren't true ice wines and cannot put "icewine" or "eiswein" on the label. In the U.S. you'll see such wines called "vin de glaciere" or "icebox wine". I'm not going to be too much of a stickler for WBW #27. Ice wines are uncommon enough that I don't want to make it harder, so if what you find is "icebox" wine, go ahead and join in anyway! 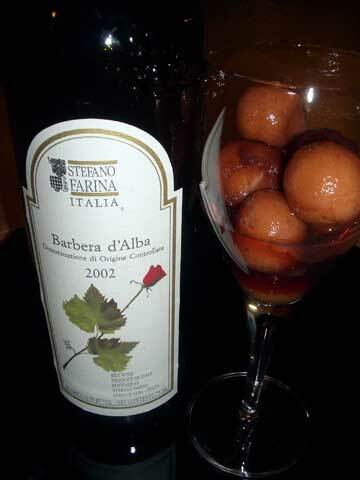 Dessert wines not made with frozen grapes, however, would not fit the theme. Between now and November 8, 2006, enjoy a bottle of ice wine (preferably with friends! ), with or without dessert. Email [email protected] on Wednesday, November 8th 2006 with the URL to your Wine Blogging Wednesday #27 post, and I will include you in the WBW #27 Round Up. Optional: include your location (as general or specific as you like). And I will do my best to have the Round Up as quickly as possible to do some holiday wine shopping. Wine knowledge is one of those things that seems mysterious to those who don't know much about wine, and sommeliers and oenophile are creatures who live in an exaulted world high above mere mortals who stumble over restaurant wine lists, cross-fingers when ordering, and hope they don't look like fools to their friends or, god forbid, business associates. So, being a mere mortal, joining in a Wine Blogging Wednesday is a bit scary. This month loveSicily is hosting Red Sicilian Wines. 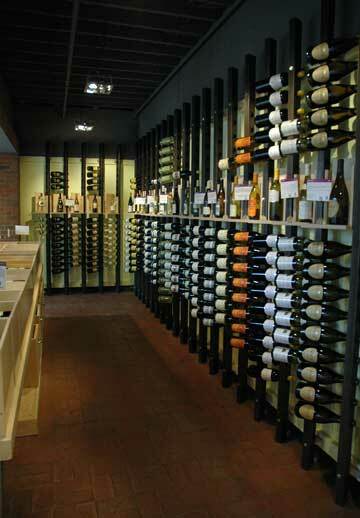 But the best learning comes from doing, and so with the quest defined, I went to Everyday Wines for advice. Mary quickly recommended the 2004 Cusanamo Nero d'Avola. I also searched around town for other Sicilian reds that would not be too similar to the Nero, but the ones I found were beyond the budget I had set for this experiment. We invited a pair of friends over for dinner and had a grand night feasting and enjoying the company. I opened the bottle about an hour before the main course, which was a simmered Sicilian chicken dish with a sweet marsala-based sauce. I was somewhat nervous about the pairing. I mean, a marsala flavored sauce with the nero d'avola wine? I had no idea how it'd work out. I'm not especially good at pairing wine with food -- I usually rely on an expert to point me to a good match -- but I can tell when a pairing is disasterous. And this one wasn't. (whew!) 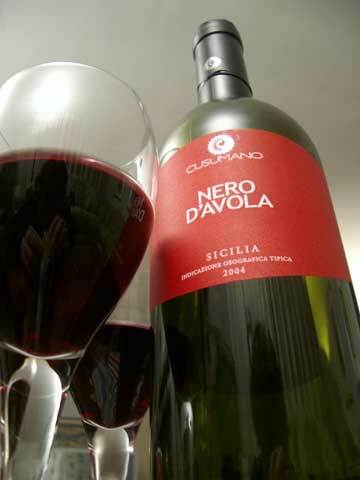 I suspect this Nero d'Avola may be a fairly friendly wine that goes well with a wide range of food. When this wine has had some time to breathe, the fruit-like scents and flavors really come through. I'm not experienced enough to actually identify specific scents and flavors without being prompted, so I've included Everyday Wines more detailed assessment at the end of this post. Click on the thumbnail image at left to read Everyday Wine's review of the 2004 Cusanamo Nero d'Avola. Mary Campbell, who runs Everyday Wines, has created a delightful shop featuring quality wines from around the world at reasonable prices. 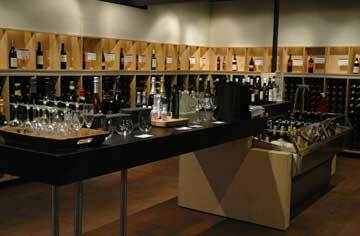 She and her staff taste every wine and provide descriptions that include food pairing suggestions. I'm not a wine expert, and I don't drink wine very often, so when I do buy wine I want to feel reasonably comfortable that I'm going to enjoy it. Mary has been fabulous with her knowledgeable suggestions and friendly assistance. (Back in December, she matched a red wine to cantalope for me, and it was wonderful.) She takes a real interest in her customer's needs and goes the extra step to help them find what they're looking for, and her staff is no different. I recently stopped in and asked about a wine, and though Giri, who works for her, couldn't find it for me, he remembered to mention it to Mary, who dropped me an email with information about the wine. In my book, that's exceptional customer service. Every year Joe and I host a holiday party — the party where I serve the trifle. We serve a great many savory and sweet items, and our guests bring a numbing number of additional dishes. Though some dishes, like the trifle, have become traditions that I dare not break or face the wrath of our guests, I try to rotate at least one or two dishes each year. Several years back I got the idea of looking for recipes in that most mundane of American cookbooks: the Betty Crocker Cookbook. It's one of those cookbooks that have a lot of basic recipes but also feature monstrosities out of some parallel universe that I wouldn't feed to my cats. This year's selection was "Melon Balls in Wine." Knowing that the wine could make all the difference, I headed to Everyday Wines in Kerrytown and asked for a recommendation. The owner gave me a puzzled look. Cantaloupe marinated in dry red wine? She hadn't heard of such a thing. I began to worry. What if I picked one of those "monstrosities", you know, like a "Cabbage Mold", that no one in their right mind would serve at a party lest they face ridicule all the days of their lives. But after only a pause, she decisively picked a wine and said, "This wine loves food." Oh, and would I be so kind as to tell her how it turns out? How did it turn out? Just before putting it out on the buffet, my mother-in-law and I tasted the melons and wine decided that maybe we'd keep it for ourselves. The wine was scrumptous all by itself, sweet and tinted with a lovely canteloupe flavor. But being unselfish people, we set it out. In the morning Joe informs me that his parents took some of the melon balls and wine home with them. "Did they leave any for us?" was the first thing out of my mouth. Sprinkle cantaloupe with sugar, pour wine over the cantaloupe, and stir gently. Cover and refrigerate at least one hour.